It looks like a nightmare to build but efficient as long as there aren't many trains on it. As I remember it, it took a little while to get right, but as it was a dead end station with through trains reversing, all of the tracks are bi-directional coming under the bridge (inc. the nearest track which allows access to the carriage sidings which are eye candy only, including the carriages on the extreme left), and all crossovers are separated by at least one signal so it worked well even when it got busy! 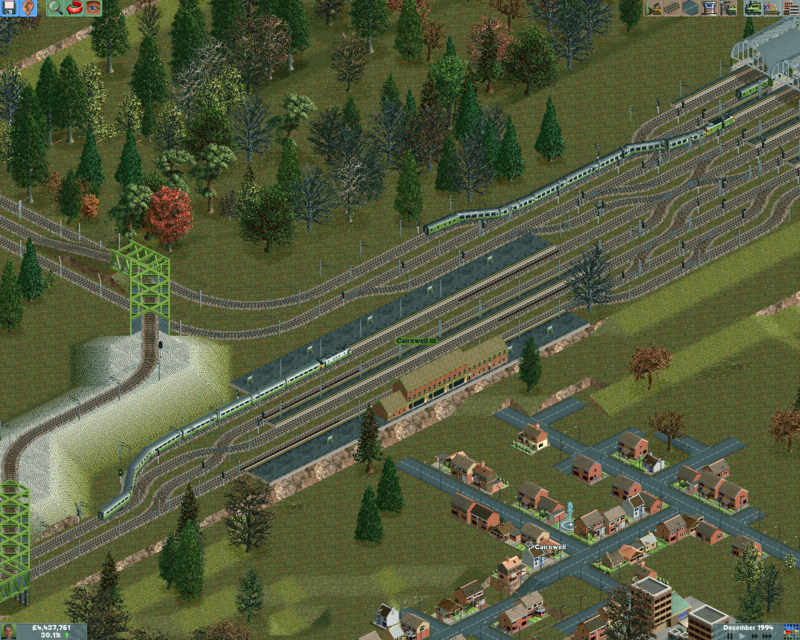 Its worth mentioning that two of the signal blocks are at least as long as the station platforms so that trains can sit inside them out of the way of incoming traffic. Here, a pair of Class 20s haul a loaded MGR coal train over another lost save game viaduct, between two stations. An express train hauled by Class 86 number 86006 ( I number my trains ) approaches Farthinghall station, passing the small loco servicing depot just outside of the station, while a pair of Class 37s thrash out of the tunnel and away from the speed restriction through the station with a fully laden grain train for the nearby food processing plant. 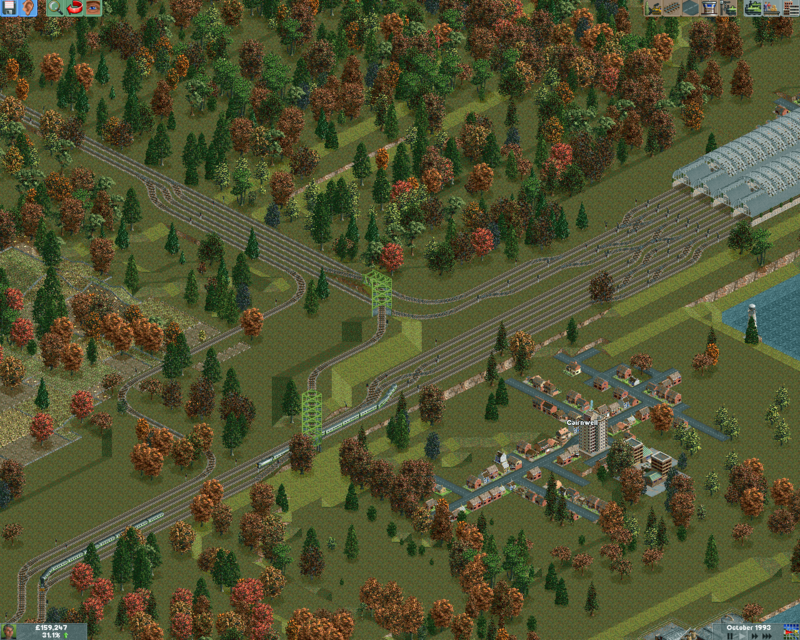 This going to sound silly, but how do you make the trains NOT stop at station? Is it made an 'express' service? but how do you make the trains NOT stop at station? Is it made an 'express' service? Yes, it is an express setting. 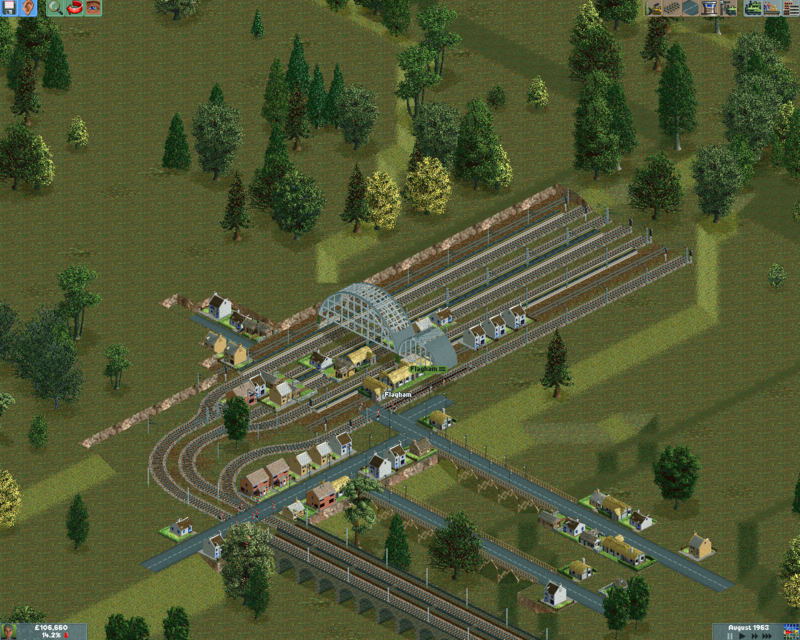 Now the train will only stop at stations you tell it to stop at. I honestly didn't realize its usefulness until recently. Now I use it to prevent blockage on road systems. May I? I've always been facinated by complicated looking junctions. The beginnings of a mainline are taking shape in Flagham. The arrival of the railway meant destruction for the town. The new order... With station lines complete, the roof and main buildings to be constructed, with only a temporary platform in operation. At least the residents could escape the building work! 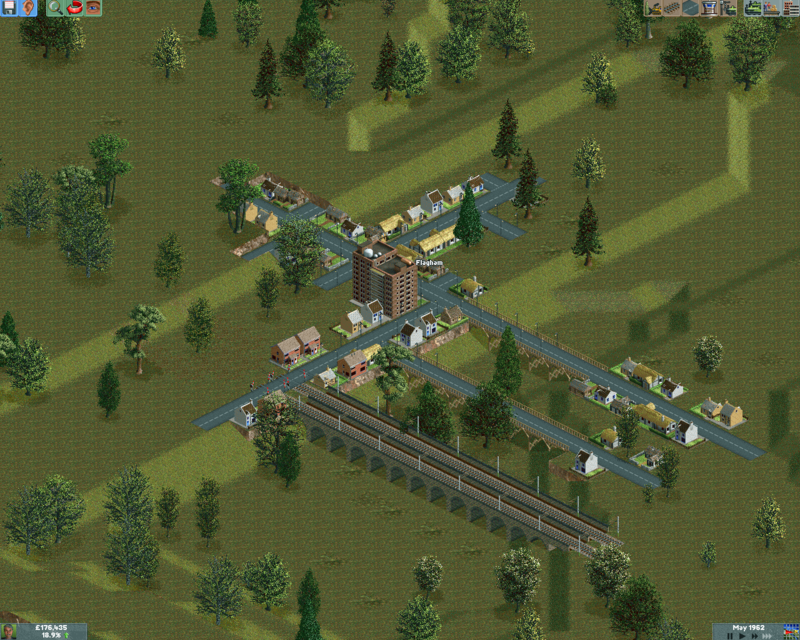 With work complete, and trains finally running, the town is able to recover. A return to the town a fair few years later shows the recovery has now turned into prosperity, with the railway bringing business and passengers to the now city. 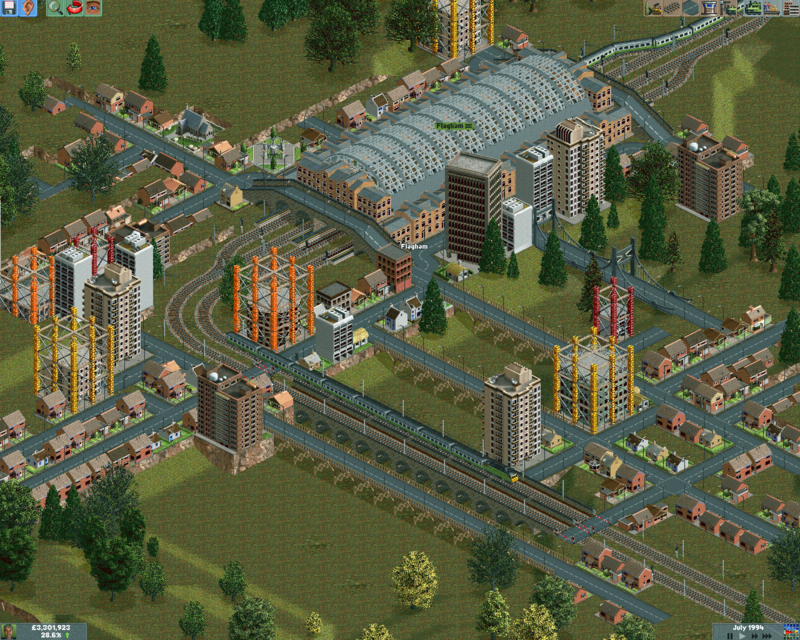 The beginnings of a network - Tracks laid and trains running whilst building is still ongoing. A junction can be seen emerging as plans are made for a large triangular junction with a distant city to the south west. The complete junction. Already, plans are being made for a new station at Cairnwell. The station throat at Winkletown, with the platforms in place for Cairnwell station. Classes 85 and 86 can be seen around the station at a busy time for departures. The newly opened station at Cairnwell serves a town in a difficult place at the end of a meeting of lines. Nice to see you back Hanlon, it's good that there are still people who play and like this game and keep the forum a little bit alive...Let me tell you this, you're not alone. File comment: Class37 Intercity, 4 passenger cars long. It's in a heavily populated city, so train lovers can witness a good thrash. 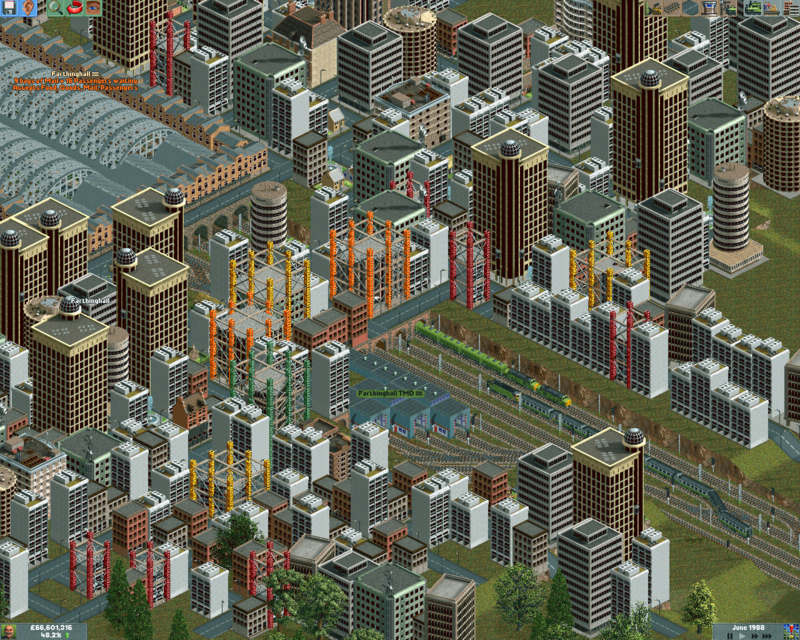 File comment: Slipton is my major city station. Served by two terminal stations. GWR going through a livery change. Class 43, 7 cars long. File comment: Intercity, GWR and XC. none of these line cross or interchange. However talks of a buyout is pending. Most of the images seem to be down, do you think you can host them elsewhere or fix the links please? Thanks! Is this a default scenario or one you generated? 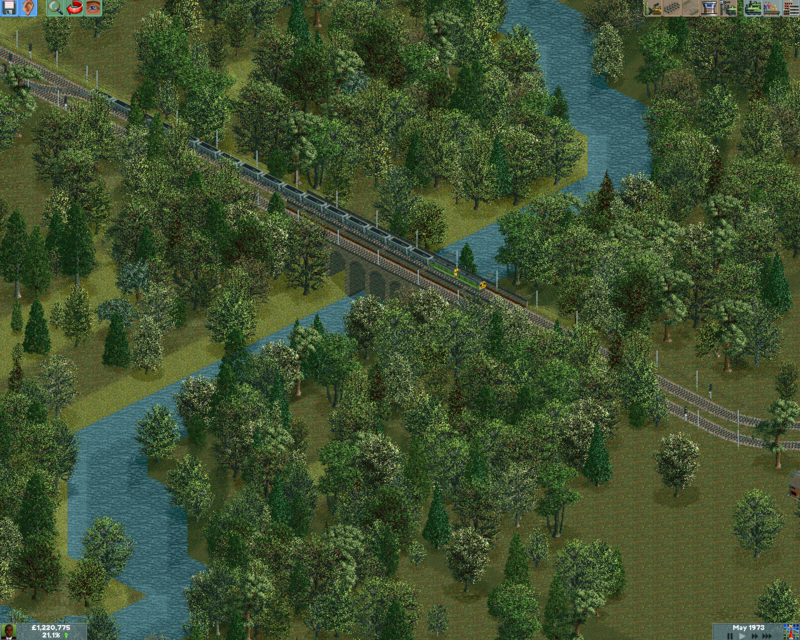 This actually gives me an idea, maybe I could make a Lake District type scenario but in the Britain setting.